After our last pizza con avocado, I have gotten more brazen about putting avocado in the oven. I’m not really sure why it seemed like a bad idea to me in the first place. 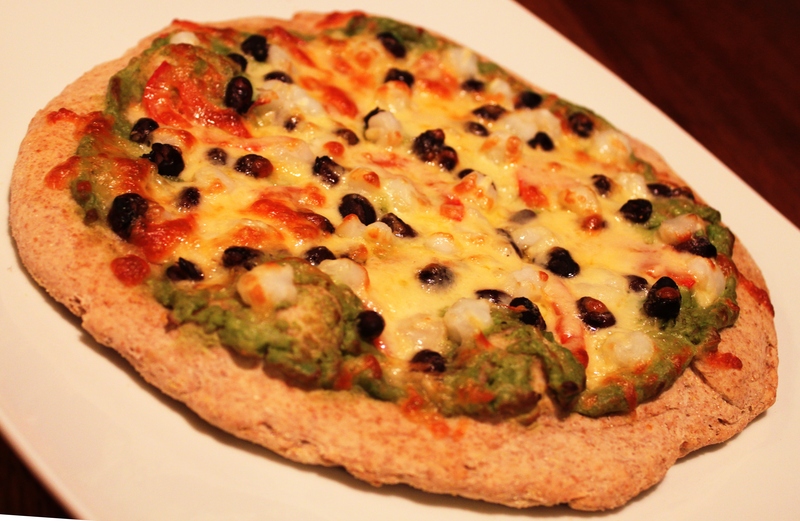 Clearly avocado in the oven is A-ok and “guacamole” pizza sauce may become the norm around here. It is far quicker and easier to make than red pizza sauce and the creamy texture is kind of addictive. We liked this pizza so well that we made it two nights in a row. Maybe that isn’t saying much though. Chris would gladly eat pizza or guacamole for any meal. No, the picture doesn’t do it justice. Now that I have effectively turned my blog into a photo chronicle of Chris’ pizza eating, I need to know: Does anyone out there take outstanding pizza pictures? 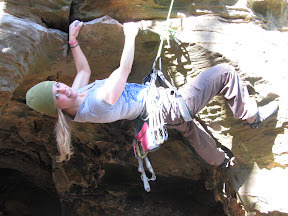 It is a skill that I obviously have not mastered yet, but it is time that I learn! Pre-heat oven to 425 degrees with a pizza stone in it if you have one. Combine avocado, lime juice, and salsa verde in a small food processor and pulse to blend. Season avocado mixture to taste with cumin and ground coriander. Sprinkle cornmeal on a sheet of parchment paper then roll and stretch dough to form pizza. Evenly distribute black beans, hominy, tomato, and shallot over the top of the pizza. To transfer the pizza to the oven, carefully pick up parchment, place on pizza stone, then slide parchment out from under the pizza. Bake for 12-15 minutes or until cheese is melted and pizza crust is lightly browned. Before our long run on Saturday I was looking for some kind of carby breakfast. Mostly bread, maybe some veggies, and of course eggs because I have been an egg eating machine lately. I am usually a bit hesitant to try new foods before long runs, but we planned on running later in the day and I had already tried out each component of this as a pre-run breakfast, so I decided to give it a go. 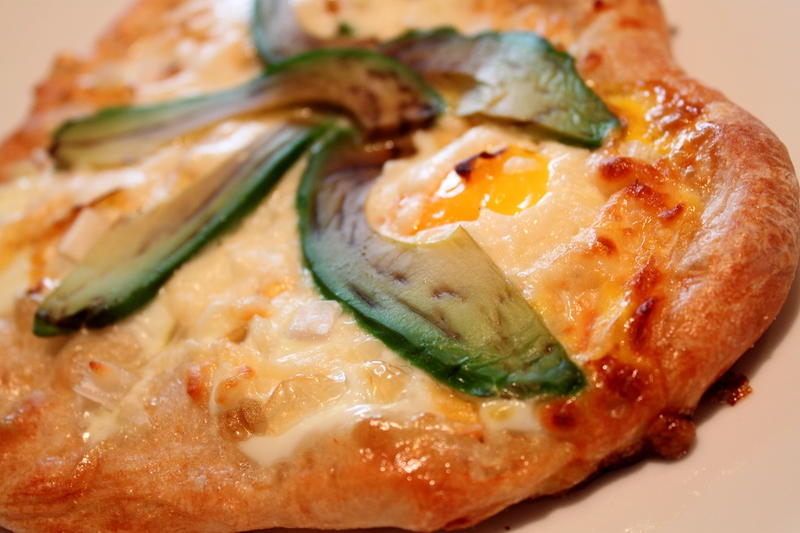 I was disappointed that the avocados turned brown in the oven because I thought that took away from the asthetics of the pizza, but the vibrant yellow egg yolks more than made up for it. This pizza was so fresh tasting and the aroma that wafted out of the oven each time I checked on it was just incredible. Overall, this was a huge win. We both commented that we could definitely serve this to other people and even discussed having it again. Maybe even for dinner. Toss rutabaga (or potato) in 1 tsp olive oil until it is lightly coated, season with salt and pepper, then saute over a medium-high heat until lightly browned, then set aside. Lightly brush the crust with the remaining 1 tsp of olive oil, then distribute minced garlic over the crust. Crack three eggs onto the crust being careful not break the yolks. Arrange rutabaga “hash browns” and shallots on top of the eggs, sprinkle with Mozzarella, and place avocado slices on top of the cheese. Note: If you prefer not to eat the egg yolks, they can be left out or easily removed with a spoon after baking, but they do make for a much prettier pizza. 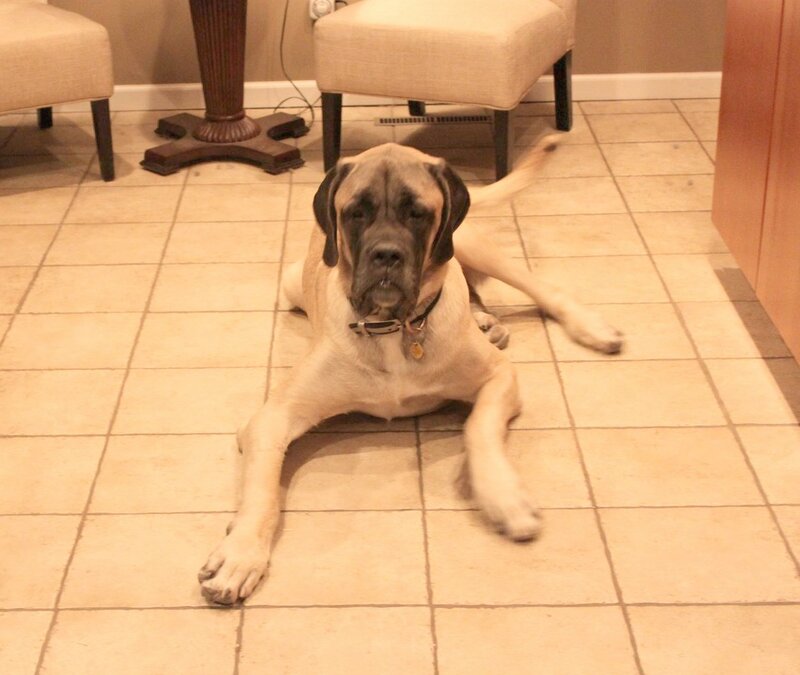 Duke supervising the pizza making process. A few weeks ago while Chris and I were up late sorting Africa pictures, he made himself a snack. It was a pizza-like concoction that he chose to dunk in a mixture of Dijon mustard and Thai sweet chili sauce. At first, I was mildly grossed out by the whole thing. Finally, curiosity got the best of me and I asked Chris for a taste. It was out of this world! I wanted some. In fact, I didn’t just want some, I wanted a whole meal centered around this delicious sauce. At first we were thinking some kind of chicken pizza, but after assessing the ingredients we had on hand, this is what we came up with. As we set out to make it, I never intended to blog this recipe. I simply didn’t think it could possibly be that good. But it was. Maybe our best pizza yet! In a small bowl, stir together Thai sweet chili sauce and Dijon mustard. Start with a 3:1 ratio of chili sauce to mustard, then adjust to taste based on your preference for sweet or spicy. 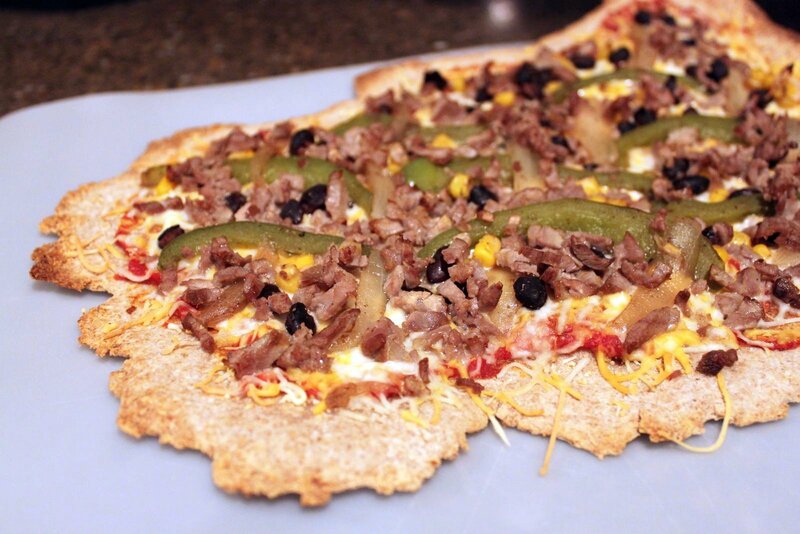 On a surface lightly coated with corn meal, stretch and shape pizza dough into desired shape. Spread chili/mustard sauce in a light, even coat over the pizza dough. 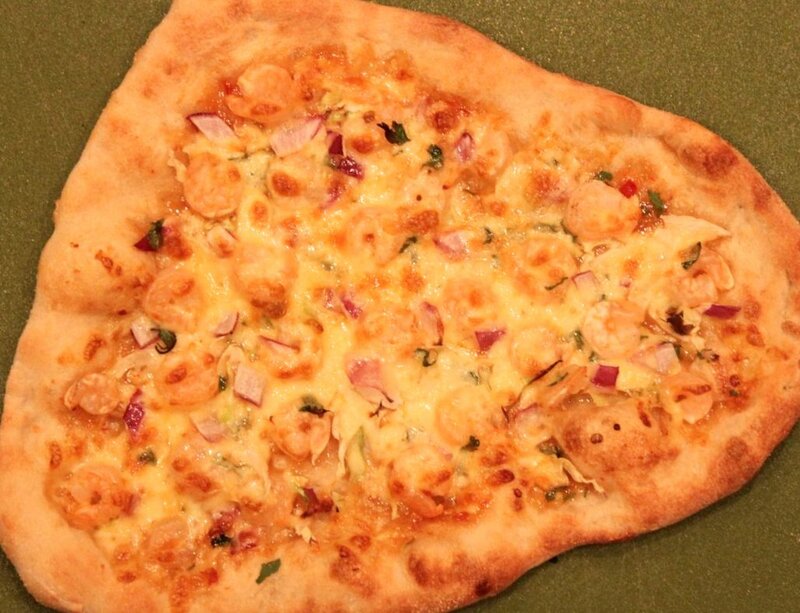 On top of the sauce, layer cabbage, shrimp, onion, cilantro, and finally cheese. Bake for 10-12 minutes or until cheese is melted and the crust is a golden brown. Southern Indiana is almost the least snowy place that I have ever lived. Indiana in general is far less snowy than anywhere else that I have lived. Not so fast. You see, each place has had essentially the same winter temperatures. …well, that’s just a bummer. Lucky for me, we are experiencing record snowfall here this winter and we have already made two trips to our local “mountain” for snowboarding. After a long day on the snow, this warm, comfort-foody dish really hit the spot! Prepare beans by soaking them overnight in several inches of water. Drain and rinse the beans, then begin to boil them in a large pot covered by a few inches of water over a high heat. Add the rutabaga and a sprinkle of salt and reduce the temperature to medium-high. Stir occasionally as the beans and rutabaga continue to boil, adding water as needed. While the beans and rutabaga cook, prepare the greens. Wash and chop the greens, then place them in a large pot and cook them over a medium-high heat, covered, for about 30 minutes until they have wilted. Stir the greens occasionally, adding water as necessary to keep them from burning. After about an hour, the beans will begin to break down and the rutabaga will become tender. Continue cooking until the water has evaporated. When the consistency has thickened, remove the pot from the heat. Add the butter, then beat with a hand mixer until smooth adding milk as necessary. 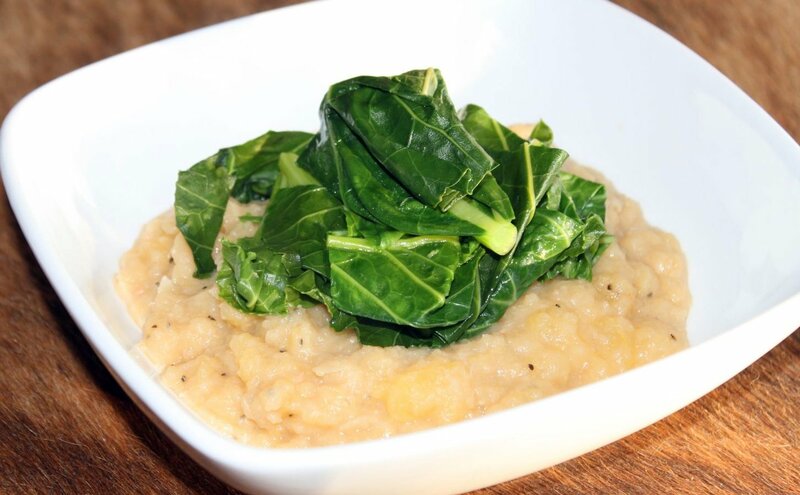 Divide the cannellini and rutabaga purée into five bowls, and top with the warm, tender greens. After last winter’s love affair with Mac and Cheese with Squash and Peas and my obsession last fall with Pumpkin Ravioli, I knew that I had to try this recipe as soon as possible. 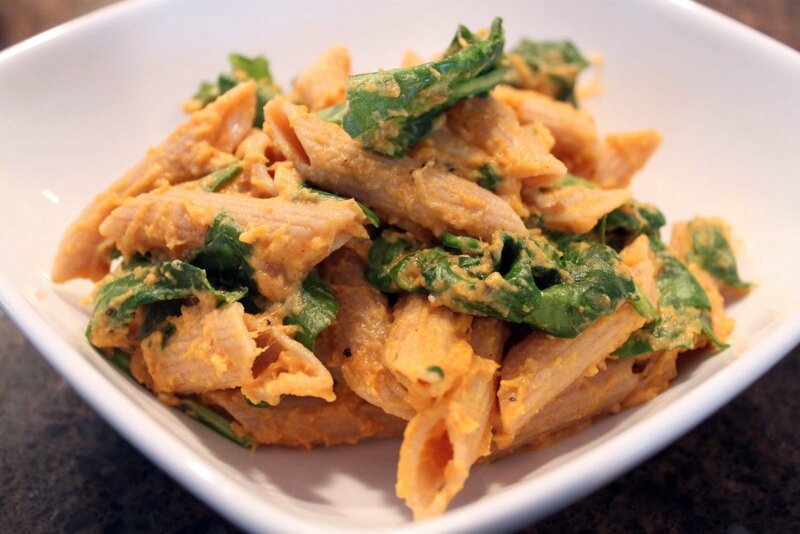 It is essentially a hybrid of my two favorite pasta dishes and it did not disappoint. Sunday afternoon I spent a few hours attempting to cook enough meals to last us for the whole week. It worked out pretty well. As of Thursday morning we still have two portions of food remaining for Thursday night dinner. For a long time, I did a weekly Sunday cooking marathon. I can’t quite remember why I stopped. It may have come to and end during a phase of grocery list apathy. Cooking everything on Sunday means writing all of the necessary ingredients on the same grocery list in time for weekend grocery shopping. Another theory is that I stopped doing it when we joined our CSA. The CSA seemed like a nice idea, but the Wednesday produce pickup did not fit in all that well with our Saturday grocery shopping scheme. It had me going to the grocery store on Wednesdays and Saturdays which was far too often for my taste. Whatever the case, I may need to revive that ritual so we can have another week mashed potato free. Adapted from Meet Me on the Corner of Peachtree and Peachtree. Cook pasta, drain, then return to pot. Set burner to a low heat, then mix in the remaining ingredients. Cover and let it sit on low heat until the spinach is completely wilted. Add additional milk as needed. I am happy to report that I survived the onslaught of Halloween candy and managed to only eat 15% of the goods (but 45% of the Butterfingers). I’m not sure if that is particularly impressive considering that we had 30 full-size candy bars and I ate 4.5 of them in 36 hours. Wow, that sounds gross. Thankfully, Chris brought the remaining 20 some-odd candy bars to work with him to eliminate them spread Halloween cheer to his co-workers and gain popularity in his water cooler circle. Ok, we don’t really have water coolers at work, but Chris does have a cubicle right next to his local printer, so he gets pretty heavy traffic at his desk and never has a problem giving away candy or baked goods. Pre-heat oven to 450 degrees with a pizza stone inside. Roll out pizza dough and sprinkle it lightly with cornmeal on both sides to prevent it from sticking to the pizza stone. 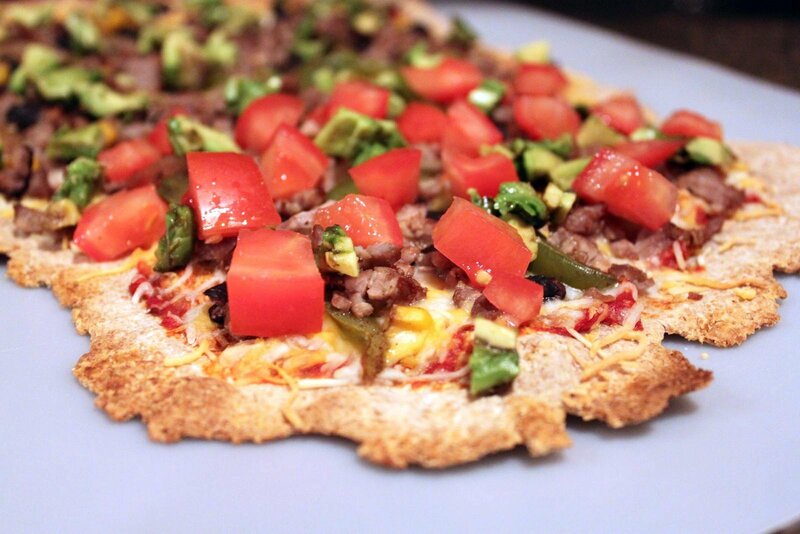 Top the pizza first with Mexican pizza sauce, then with cheeses, steak, onions, peppers, black beans, and corn. Place the pizza in the oven on the pizza stone, the easiest way is to use a pizza peel, and bake until the crust begins to brown and the cheese is fully melted, usually 10-12 minutes. 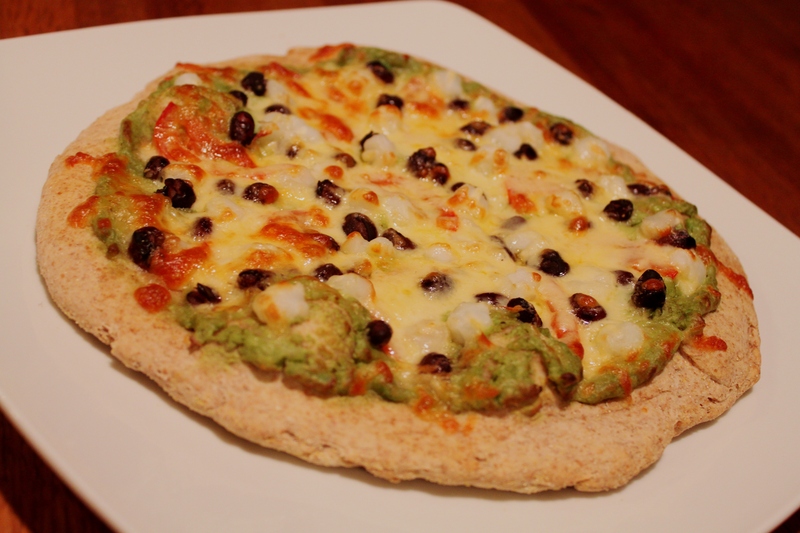 While the pizza is baking prepare any additional cold toppings such as avocado, tomato, and sour cream. Remove pizza from oven, top with any cold toppings, then enjoy! Calories ~ I’m not even going to attempt this one, it depends on your toppings and your pizza crust. After we decided on Mexican Pizza for dinner on Saturday night, we knew that standard pizza sauce wouldn’t do, so I began scouring the internet for a good recipe. Nothing was really catching my eye until I saw this one. It sure was! The only issue I had was the quantity of sauce it makes. Most of it ended up in my freezer for future Mexican Pizzas. Note: Vinny works at the prison, he is not the actual inmate. Blend for several minutes until smooth and well combined. Servings ~ Makes enough for three to four large pizzas.